This was once a very fine W W Greener 12 guage side by side, sidelock hammer gun, and could be once again. The checkering is in a very bad way but the lines are still clearly visible so I will be following them when I re-cut it. Right now both the stock and the fore end are in my special solution which will both remove the current finish and extract any mineral oils that have made their way into the Walnut. 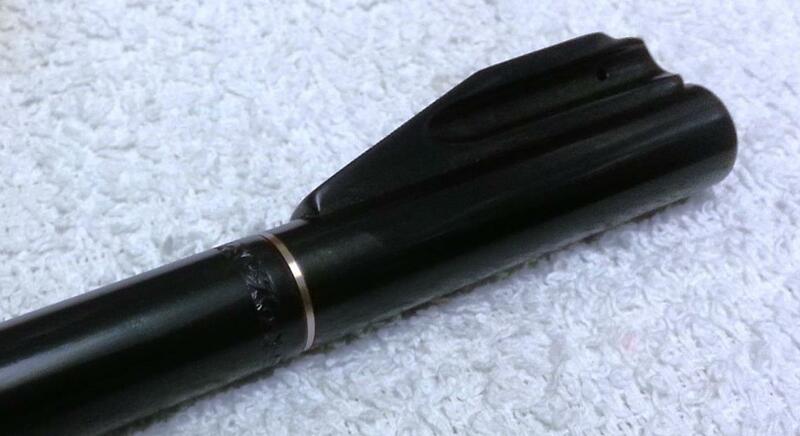 The forestock is missing the horn insert but is in otherwise good condition. Should be simple enough and it will be, given time. Restorations of this type take time more than anything else and this will take four to five months, One thing you cannot rush and that is the refinishing of a fine Walnut Stock, that takes up most of the time. I find that because the Stock dictates the pace at which you work, the rest of the gun can be worked on with no sense of urgency and this contributes enormously to the quality of the finished gun. This entry was posted in News and Workshop and tagged greener on by tenmetre. 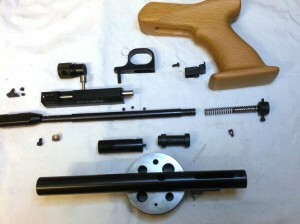 Well, Mr. Molloy has excelled himself again, I picked the barrel/receiver for the custom rifle build up today. Colin always does excellent work but the really dark, midnight blue he applied to this sets the engraving off just beautifully. The stock is about half way through it’s treatment too, I think I have about four coats of oil on it so far but there are quite a few to go yet. It is showing signs of it’s potential though. I will spend some time on the stock over the next couple of weeks and start building the receiver up. I need to Jewel the extractor next which is a great excuse to finally build an indexing jig for Jewelling. Just a quick update really, I fashioned the band for the front sight today. 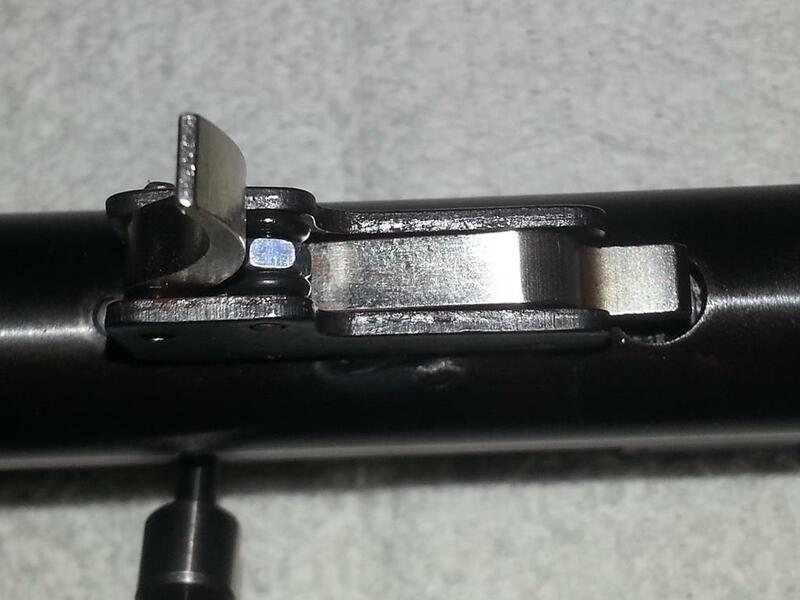 The piece of the barrel that was cut off was bored and threaded for the shortened barrel and this allows the retention of the front sight. Using Gold allows fine adjustment as it is so soft and it grips both parts holding the sight blade horizontal. As soon as I have built up the receiver I will do a dedicated page as there are other, fundamental, changes to the style of this rifle. This entry was posted in News and Workshop on by tenmetre. A couple of weeks after I wrote the original article about the Air Force One I saw my friend Charlie. Look here he said, I have modified that trigger. It wasn’t until he produced his Air Force One Target pistol that I realised what he was talking about. This has got to be one of the simplest of mods ever. It is brilliantly simple and just works. The photographs below tell the story but you can see here I used a 3mm nut and a couple of ‘O’ rings around the trigger stay pin. The modification took more time to photograph than to actually carry out and the bits were from the “parts” bin. 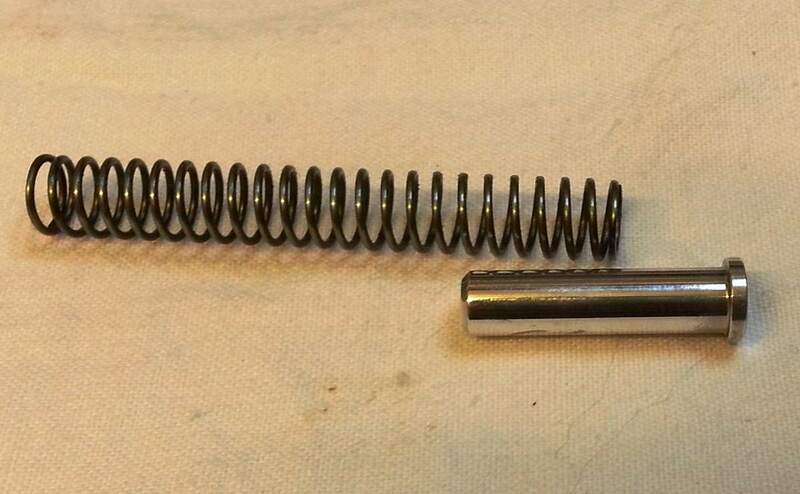 The next step is to reduce the hammer spring thereby reducing the power a little. It is a bit lively for Ten Metres. Our engraver has finished the Brno .222 and this time he has excelled himself. This rifle is a long term build project and will become a stand alone article in itself at some point. Meanwhile, a few photographs of the engraving to whet your appetite. 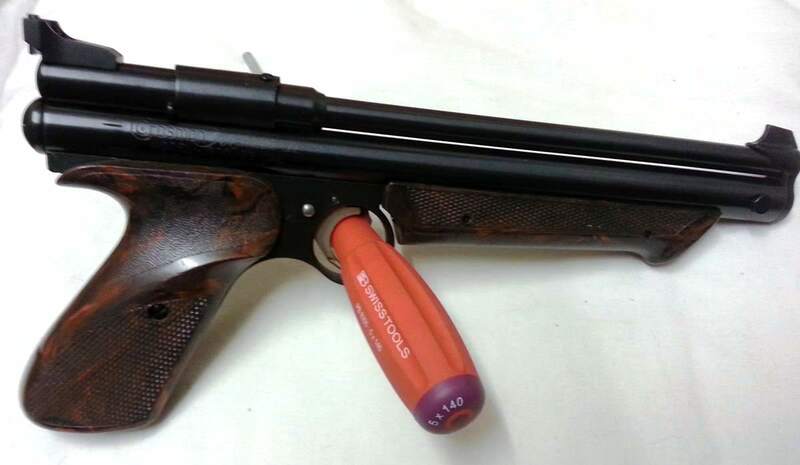 Seems a shame to Blue the gun really and one of these days someone will take the sensible route and ask me to polish the barrel to a very high level of finish, engrave it and just leave it like that. Or colour case harden it……………. Yes, the Greener company still exists, far smaller than the heyday of gun manufacture for the two World Wars but still manufacturing some of the finest sporting guns in the world. 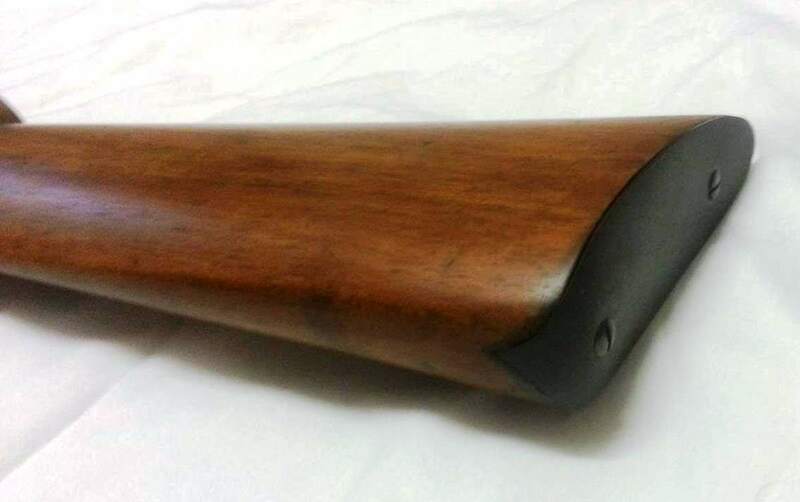 But back at the turn of the 20th Century Greener took out a Patent on the “Two Horned Sear” the first of these having been seen on an air rifle made by the Lane Brothers. Further Patents followed in 1934 and the most interesting of these was the classic forward and drop motion of the barrel invented by the Glasgow Gunmaker James Dougal. 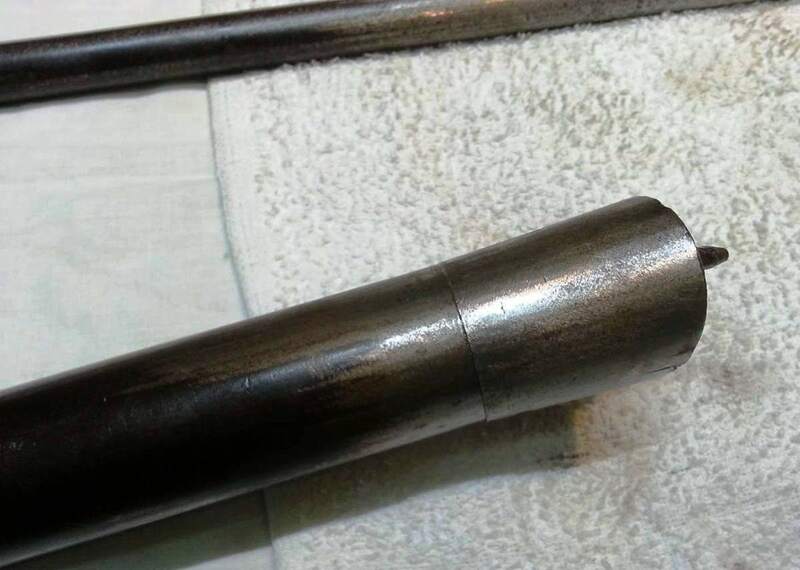 The pictures show the spiral oil groove ground into the pivot pin and this has played a major part in conserving the rifle in very fine condition internally. Pity the external of the rifle wasn’t kept oiled. Mr Colin Malloy worked his usual magic and the reblueing is magnificent. Sadly, the stock was “restored” by an amateur (NOT the owner may I add) and I have now restored a stock and the rifle looks superb in the flesh. This entry was posted in News and Workshop and tagged Facile Princeps, greener, sporting gun on by tenmetre. 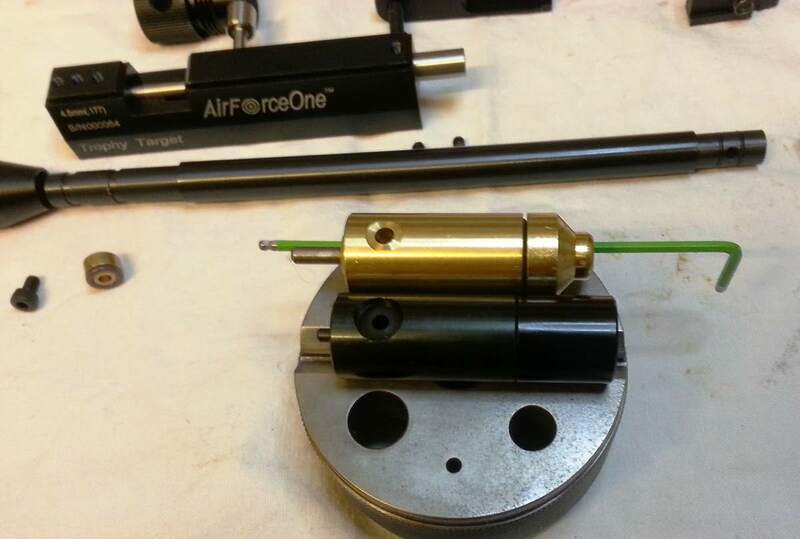 Much of today has been spent developing a Silencer Adapter for the Air Force One Target Pistol. 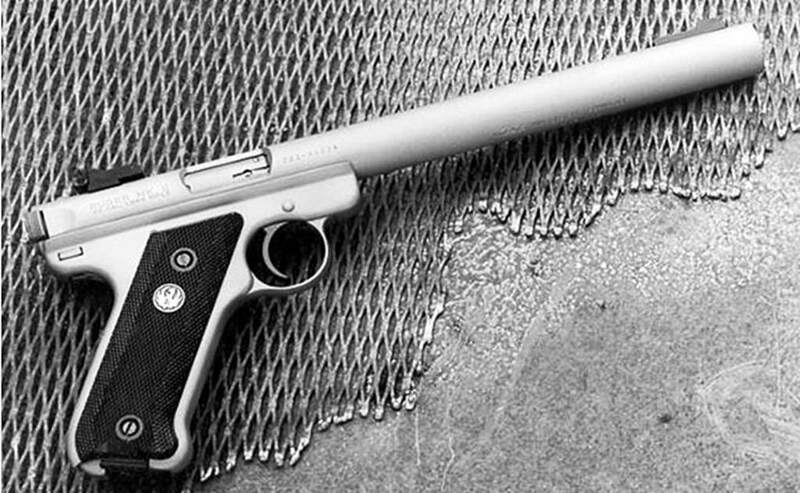 One of the immediate observations was that it would suit an integrated silencer very well. The only issue we could see, with any silencer installation, was the loss of the front sight blade, losing the open sights. 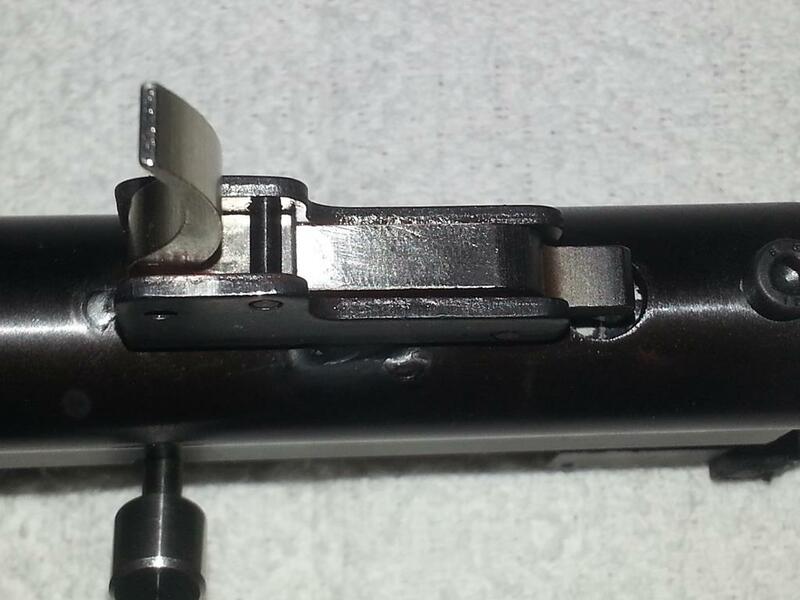 I am going to continue developing this adapter setup as it might be possible, with a shroud system similar to the Ruger MkII and MkIII rimfire pistol, to keep the open sights. Watch this space for that one! Naturally this is an expensive way of adding a silencer if you already have one, the first of the straight adapters will be finished tomorrow and if you already have a pistol silencer it will be a straightforward fit. Having had an opportunity to spend some intimate time today with the barrel (?) I thought the Ruger MkII silencer style might compliment the gun well. 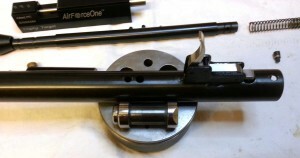 This style of Silencer, which is also a full length shroud, would enable the retention of the front sight element. I will look into this and possibly offer it as an option. 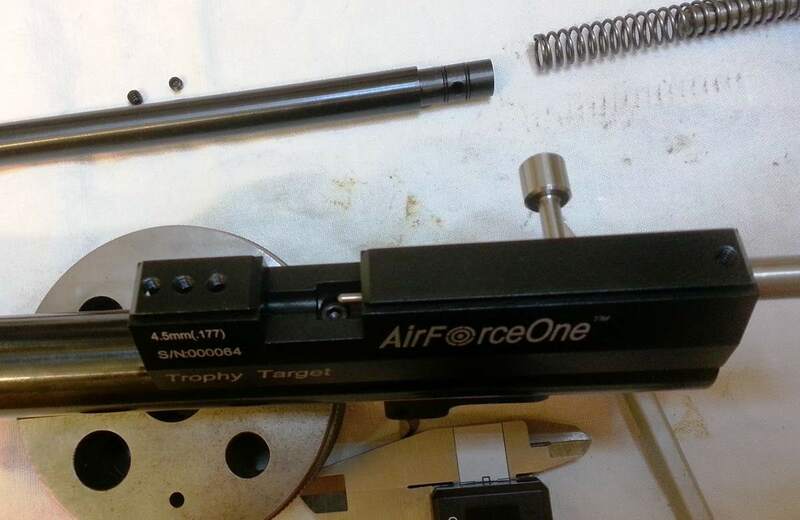 The fact that the Trophy Target has a 12mm barrel diameter helps the project. We will see. 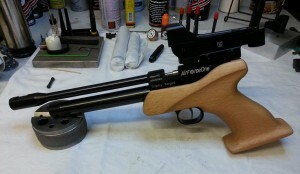 The silencer on the Trophy Target pistol above is our own design. It is a 1″ (25mm) pulltruded Carbon Fiber tube with a primary blast chamber surrounded by ballistic cloth leading into a secondary, smaller, chamber which is narrower and shorter than the first. 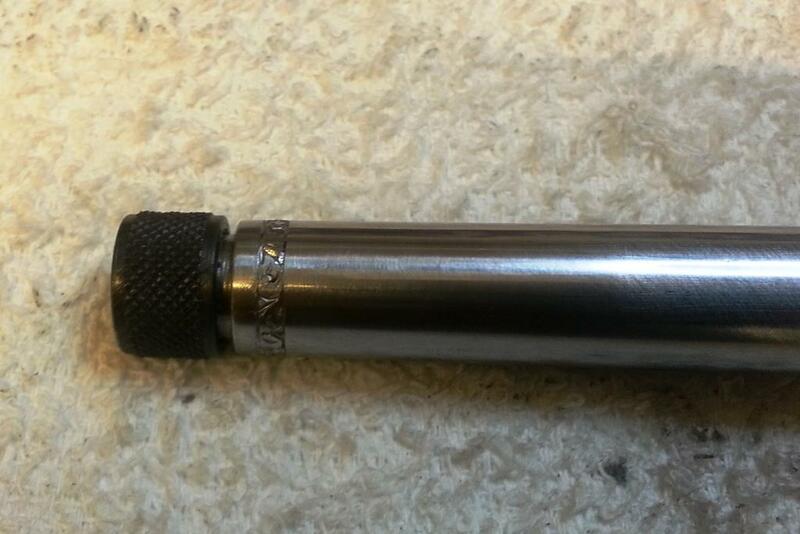 The Carbon fiber tube is held at both ends with machined from solid, hardened, EN30 aluminium. 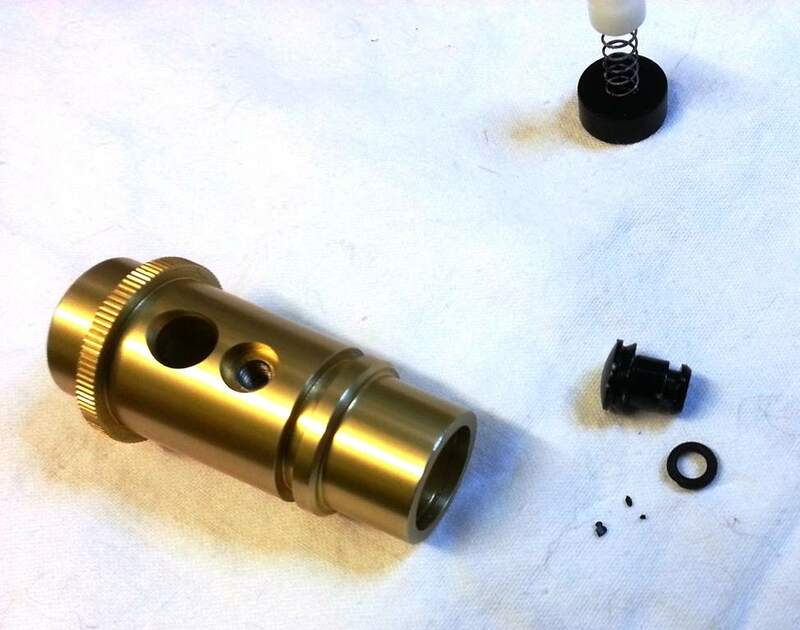 The blast chamber separator is also a machined component with the beginnings of a K Baffle on the Blast Chamber side. For it’s short compact length it is very effective. This entry was posted in News and Workshop and tagged silencer adapter, trophy target on by tenmetre. This is a long anticipated pistol. It fits the gap left by the exodus of the Aeron Brno and similar pistols. 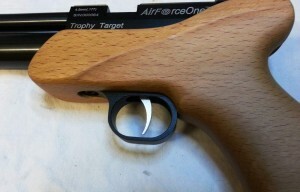 For a long while now, people wanting to get into target pistol shooting have been able to start at the bottom with something like a Crosman 2240, or enter the giddying heights of Styer, Feinwerkbau or Walther offerings. With nothing much in between. The Chinese to the rescue I suppose. I would dearly have liked to have entered the market at this point and indeed, one of my good friends on the CAPA, pmh, suggested we do just this with his “let’s build a pistol” post last year. The whole idea abandoned because of the liabilities involved. There is also a “Verminator” model but the less said about that the better, it is in .22 caliber. All ten metre target guns are .177 of course. I really hoped to see a two stage trigger here, I really did. 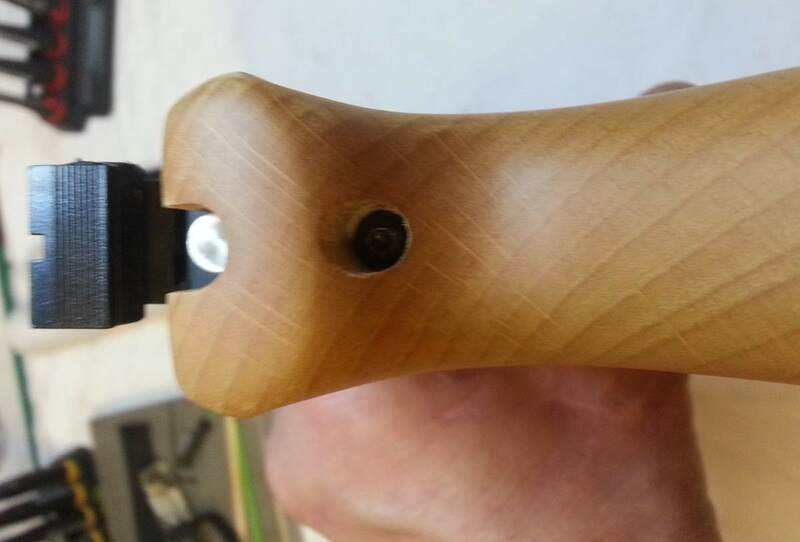 No such luck though but the position of the trigger housing and the sheer size of the Beech wood grip does give rise to the possibility of a “drop in” conversion in the future. Now you will notice, comparing the two images this one and the one above, that the hammer has gone from a dull black to a shiny silver, this is the result of polishing. It is not all I polished though. I carefully stripped the trigger and gave all sliding surfaces a good polish after taking out all of the imperfections with a slip stone. 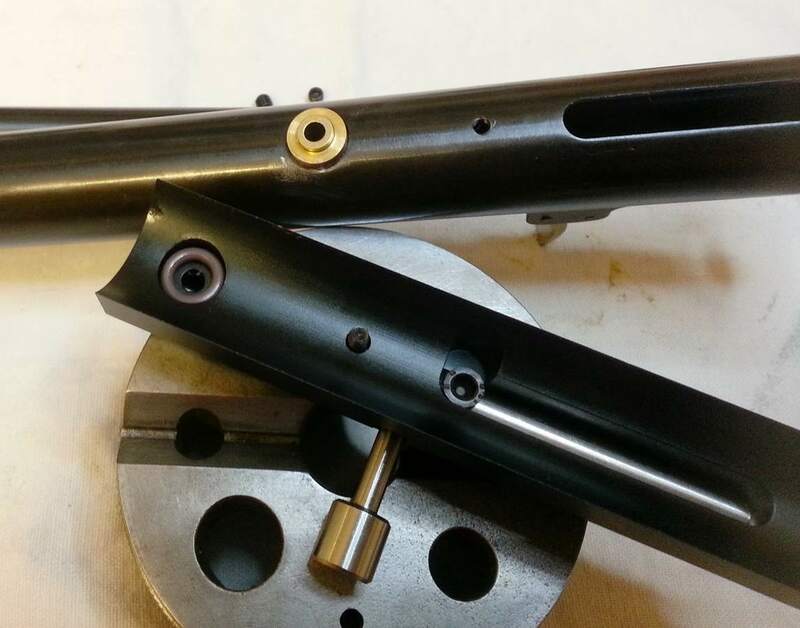 Here is the actuator valve, the body is black anodised aluminium and next to it is the Crosman valve from a 2240 for comparison. I let you draw your own conclusions but tomorrow I will put it across the Chrono. 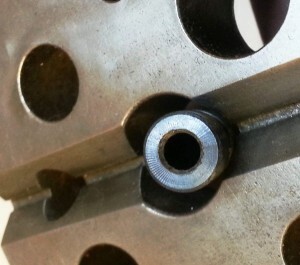 A shot of the transfer port. 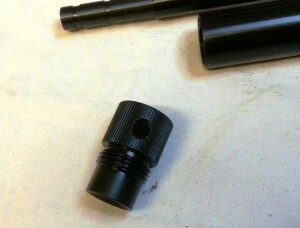 Gone is that bloody awkward round plastic seal of the Crosman and we have two O rings one top and one bottom. I would rather hope they are Poly too and from the look and feel of them they could well be. A refreshing change from the Chewing Gum used in that other well known Chinese CO2 offering – the QB78! Gone too is that really ridiculous countersunk cap bolt that you needed an Allen key for that nobody had, replaced instead with a 3mm Cap Screw. The Breech is now easily separated from the tube below. Indeed, all of the fasteners on this gun are Metric, something that the youth of Europe understand. As you saw above, I have been busy with the polisher on the important parts and this small silver spring guide did not escape my attention. It guides the hammer spring so I took off any and all small imperfections and ridges. 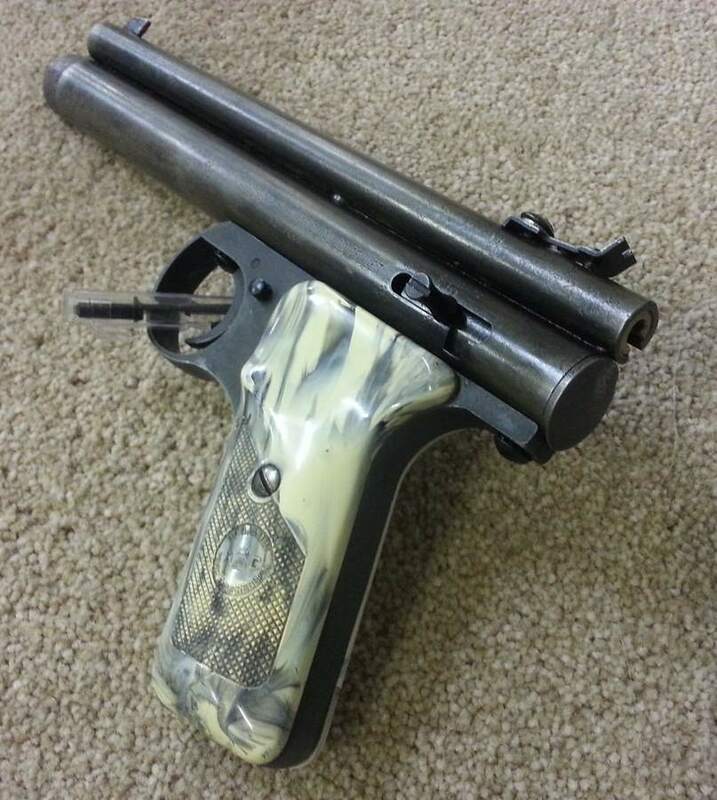 Remember, being a Target Pistol, smooth is everything. So far I have waxed lyrical about it’s entry level status as a gun available to the beginner without much outlay (they retail at £159.99 at the moment), there is also the fact that it comes complete with an adjustable sight, the breech is milled aluminium with scope rails, the O rings actually look like they might just be fit for purpose, the front sight blade is removable and easily changed for a different width/height/colour replacement (just as soon as I make some). So what don’t I like about this gun? Next up, the wood grip. In the immortal words of Phil over on the CAPA – “It looks like somebody’s third year GCSE woodworking project”! Now that paints quite a vivid picture. What do you do with this? The only thing it has going for it is that there is plenty of it to have a go at and even if you made a complete Sow’s ear of the “modifications” you could swift whittle one from the remnants of a leftover cricket bat. It couldn’t possibly look any worse. 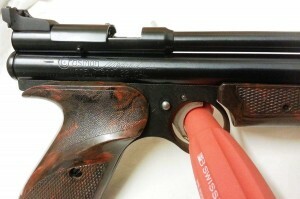 I can see a whole new Cottage Industry spring up here supplying aftermarket grips for this gun. But hey, maybe that is a good thing? Generously it is branded as “ambidextrous”. I reserve judgement. “Clublike” could be another description. So okay, I don’t like the grip but as I said, that could be a good thing for a good few people. The overall gun though is great. It fits right into it’s own slot in the market and if it gets more people into Target Shooting that cannot possibly be a bad thing. Finally, remember the trigger guard reference above? Girlie, that’s the best description, Girlie. Some of the Neanderthals I know won’t even be able to get their finger in the guard, let alone squeeze the trigger, definitely a product opportunity there for someone……. A very rare beast this one, the Medalist II. There are a good many Crosmans and variants but this has to be one of my favourites. Tucked into your waisband with a pocket full of pellets what more could a young boy have wished for – apart from an accompanying rifle. The reason for the posting? Do I really need one? 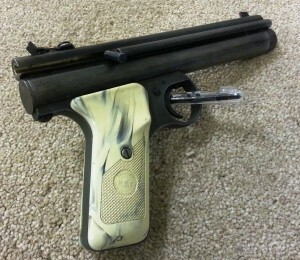 This is a very nice pistol, it has no pretensions and it is exactly as described. 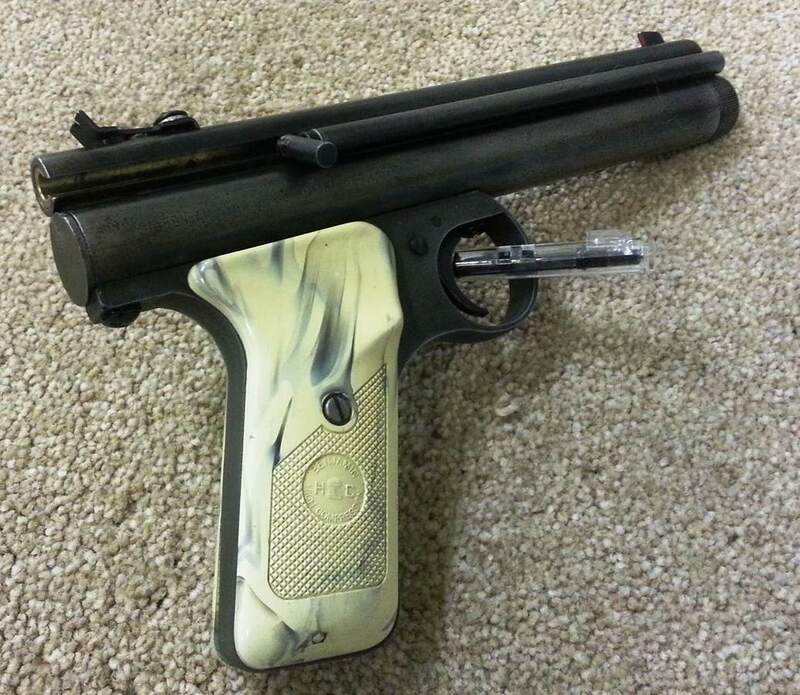 A fun pistol to shoot in the garden or out in the Jungle. Okay, so the woods then! And here is the oldest Benjamin I have had in this year, a real rarity this one and if you think the Crosman 600 was the first semi automatic CO2 pistol, think again. This really is a very rare beast and a pistol that is in very good working condition. It uses the 8gram CO2 “sparklets” bulbs, popular in the sixties and seventies but still freely available thankfully. Guns are a bit like buses, none for ages then two (or three) show up at once. In this instance, one of my favorites, a Greener made an appearance last week and then suddenly another! Threats of a third have been made too. Amazing. 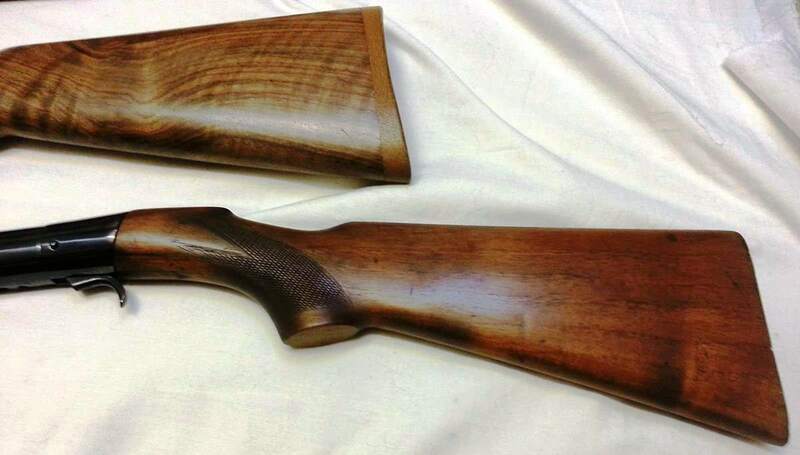 The reason for the appearance of this rifle was the “professional restoration of the stock”. I will not post the pictures up, we will move on. 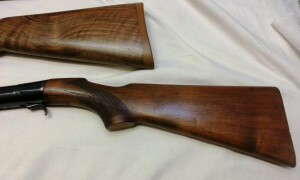 This is a vintage stock the customer supplied and I have stripped it ready for some fitting. The Walnut Stock in the top of the picture is from the second Greener this week and and has been refinished by our customer, very nicely done too. From one extreme to the other here. The ironmongery is a bit lacking though. I will say though that this gives us an opportunity to look at the before and after and really see the transformation a really good blueing job can bring. Updates to follow, should be interesting, I have both trigger guards to fit and somebody forgot to send the screws! We see a good many pre-charged pneumatics in the workshop, not a surprise really because they are very popular and there are not that many user serviceable parts in them. 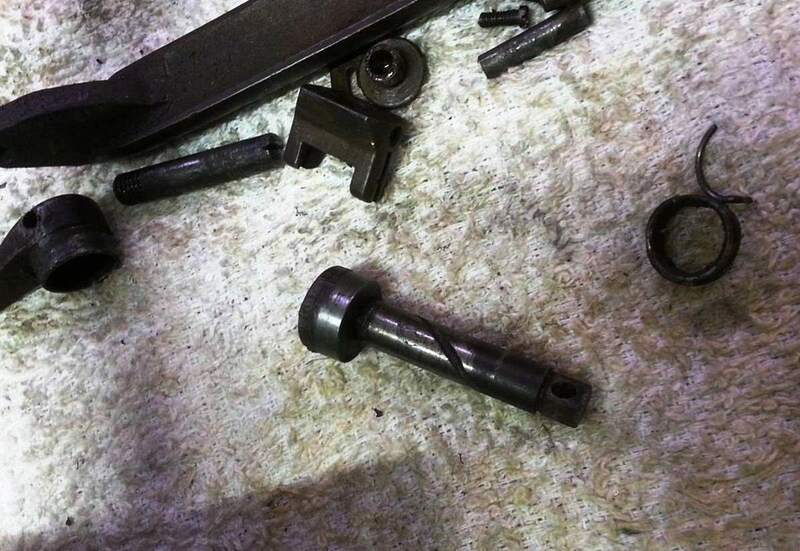 It doesn’t matter how well we look after our guns, some materials have a finite life. 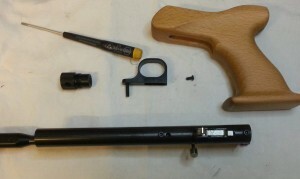 The problem with this gun was the fill valve. It leaked, but only occasionally. Dismantling the valve, this is what we found. Small particles of the O ring which was holding the dust sealing cap in place had broken off and had been pushed into the fill valve by the pressure of the fill air. 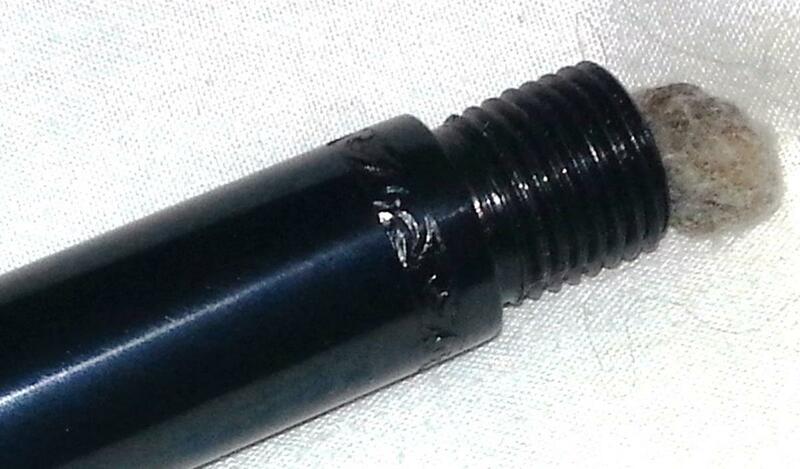 The cap that was in place to protect the fill valve had actually caused the problem, ironic really. The tiny black particles are the offending item. 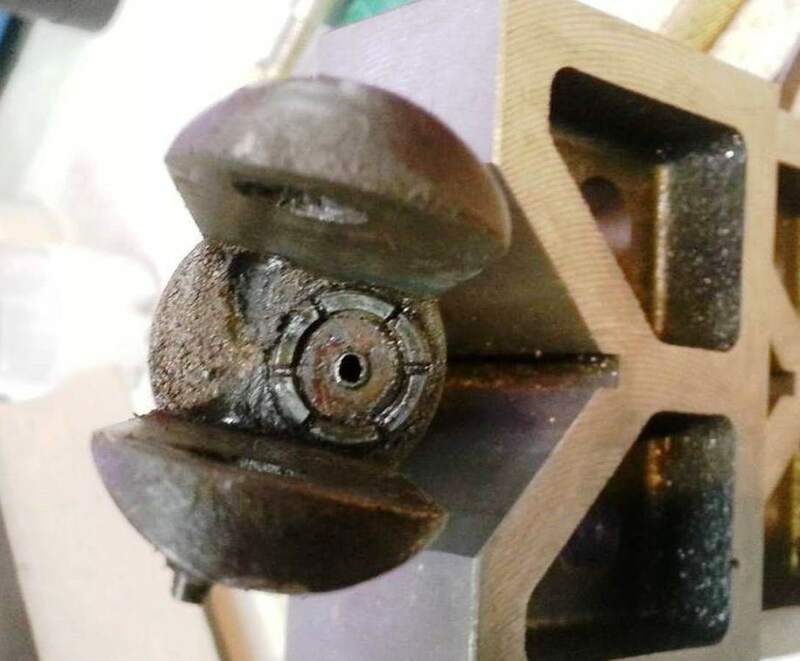 Not knowing how far these particles had reached into the firing valve, it makes sense to just strip it, clean it and replace all of the seals. Re-using O rings is a false economy.